Jagadish Capoor is an Independent & Non-Executive Director of Vikas Ecotech Limited. 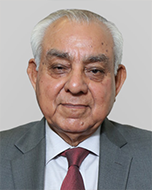 An industry stalwart, he has a vast experience of over 45 years. A former Deputy Governor of the Reserve Bank of India (RBI), he has served on the boards of several banks, i.e. Bank of Baroda, State Bank of India, National Housing Bank, NABARD, Exim Bank, and HDFC Bank (as Chairman). He has also served on the board of the Bombay Stock Exchange (BSE). He holds a Master’s Degree in Commerce from Agra and is a Fellow member of the Indian Institute of Banking and Finance.